The latest bookmaker to offer punters the opportunity to cash out on the horse racing is Betfred. You can now cash out on horse racing multiple selections, which covers doubles, trebles, Yankees and more. With the success of their football and golf cash out and advances in technology at Betfred they are now offering cash out on the horse racing. With Cash Out, players can make the decision for themselves on whether they ride out their bet or want to rein it in early-available on both web and mobile. With CashOut you no longer have to wait for your bet to finish to pocket your profit. Just choose the bet you want to CashOut and you'll be paid that amount regardless of the outcome of the event. 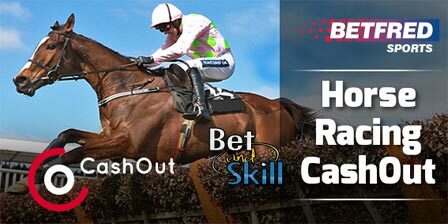 CashOut is available on selected football and golf markets and on both single and each-way multiples on horse racing pre-play, in-play, and between legs! Available on UK and Irish racing. The amount you are offered to CashOut is based on your original bet, the status of any selections which have already completed, and the current market price(s) of your unsettled selection(s). Whenever you are ready to CashOut, simply hit the CashOut button to lock in a profit if your bet is coming in, or cut your losses if your bet is going against you. 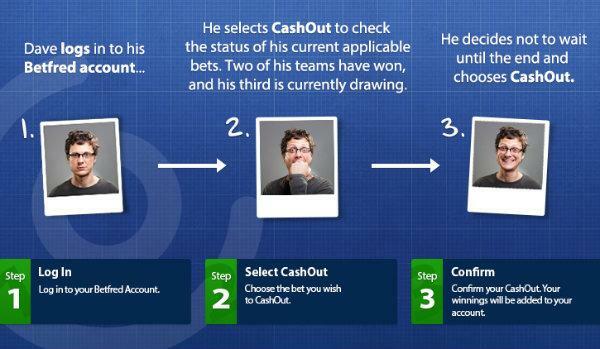 You can choose to accept the CashOut amount offered at any time, or let the bet continue to its natural conclusion. Are you looking for the best cash out betting sites? Find here the complete list! "Cash Out on Horse Racing with Betfred"